On October 22, 2014, the reign of terror continued in Canada. A soldier was gunned down, while guarding a war memorial. That violent act was followed by the shootout in the halls of the Canadian Parliament. The attacker was identified as Michael Zehaf-Bibeau, also known as Michael Joseph Hall, a recent convert to Islam. Zehaf-Bibeau was reportedly designated as a “high-risk traveler” and his passport was seized by the government. After the attack, ISIS affiliates reportedly posted his photograph on Twitter. Just two days earlier, a man who Canadian authorities said was “radicalized,” deliberately hit two soldiers with his car, killing one and injuring another. The attacker, Martin Rouleau Couture, was then shot and killed. If there was any doubt about his motivation, the perpetrator called a 911 dispatcher to explain that he was “acting in the name of Allah.” He reportedly converted to Islam in April 2013 and started to call himself Ahmad Rouleau, as well as Abu Ibrahim AlCanadi. On Sept. 21, 2014 ISIS released a video message that singled out Canada and three other nations. “If you can kill a disbelieving American or European – especially the spiteful and filthy French – or an Australian, or a Canadian, or any other disbeliever from the disbelievers waging war, including the citizens of the countries that entered into a coalition against the Islamic State, then rely upon Allah, and kill him in any manner or way however it may be,” the message read in an English translation. Aside from taking out a billboard, there wasn’t a whole lot more Couture could do to signal his intent to commit terrorist acts. His Twitter photo featured the flag of ISIS. Most of the people he followed were also supporting the group or posting messages on its behalf. 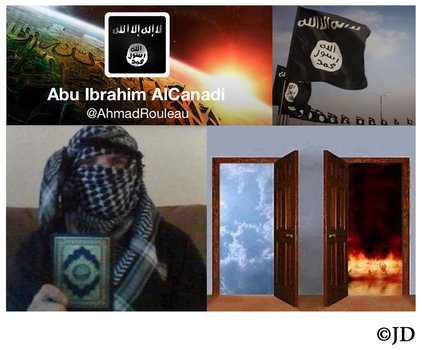 Couture’s Facebook pages, where he called himself “Ahmad LeConverti” (Ahmad the Converted) and Ahmad Rouleau, were replete with jihadi propaganda, including videos with ISIS logos. He openly spoke of his desire to die as a “martyr” and to fight alongside ISIS. Couture’s ex-wife was so terrified of his violent post-conversion attitude that she refused to let him see their child. Ultimately, she was far more perceptive than the Canadian police. Instead of placing Couture under intense surveillance, police asked his parents and his Imam to have a talk with him. Even after meeting with him as recently as Oct. 9, 2014 police did not consider Couture a threat. Canada recently raised its terror alert in response to specific threats from ISIS – the terrorist Islamic State of Iraq and al-Sham. Steven Blaney, Canada’s Public Safety Minister, said that the recent violence was “clearly linked to terrorist ideology.” Ministry spokesman Jean-Christophe de Le Rue stated that the increased threat level “means that intelligence has indicated that an individual or group within Canada or abroad has the intent and capability to commit an act of terrorism”. The surge of Western recruits traveling to fight alongside ISIS is an alarming trend that shows no signs of slowing down. Thousands of foreign fighters from many different countries travel to the region transformed into an “incubator for a new generation of terrorists.” Teenage girls from all over the world are being recruited as the “reproduction machine” for the terrorists, to help ISIS expand the ranks of future fighters. Recently, 3 Denver girls (one of them Sudanese, two others of Somali descent) tried to join ISIS. They’ve flown to Germany, planning to travel to Turkey and then to Syria. Prior to the trip, all three of them researched the plan online, visiting websites where extremists discuss how to get to Syria. Their online activities didn’t set off any tripwires the U.S. government often refers to in an attempt to justify mass surveillance and collection of metadata. The girls were returned to the U.S., questioned and released. Three Toronto girls of Somali heritage fell prey to the same recruiting tactics and recently left Canada, planning to join ISIS jihadists in Syria. They were intercepted by Turkish authorities, sent home and released under the care of their parents. There are many similar cases, but not all of them are timely detected. For example, the FBI is continuing to investigate the cases of three girls of Somali heritage from the Minneapolis-St. Paul area, who have been missing since August. While the jihadi propaganda continues to claim lives of its followers and their victims, the West seems to be unwilling to counteract it. Political correctness is gone awry, with ostrich-like designations of terrorist acts as “workplace violence.” The threat cannot be effectively dealt with, until its nature is properly and publicly acknowledged.